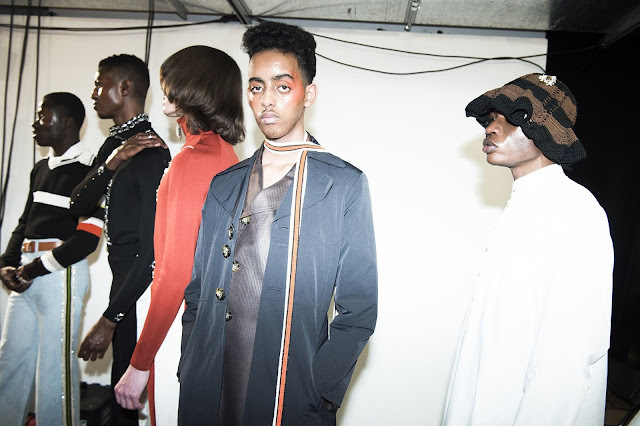 Grace Wales Bonner is one of the few off-the-bat menswear success stories. From her BA collection from Central Saint Martins back in 2014, the London-born designer subsequently became the sought after menswear designer on the calendar. She won the L’Oréal Professionel Talent Award following the London Fashion Week show, and critics continually laud her collections. 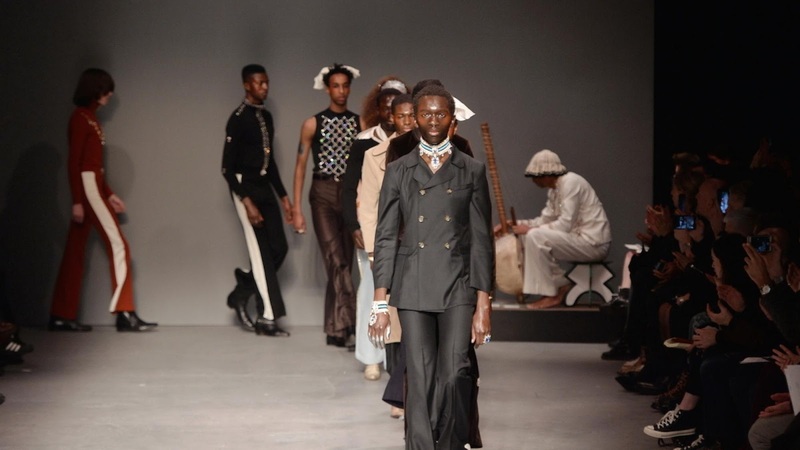 Embedded at the core of every Wales Bonner collection is—as described eloquently by Dazed—“a meditation on black cultural narratives, explored through exceptional craftsmanship and carefully considered scenography.” How riveting! Steeped in cultural and historical research, Wales Bonner does something that many others before her have been afraid of. She’s exploring race, her heritage and gender in collections like no other. She isn’t just touching upon those ideas, she’s delving deep into them. That’s admirable. It’s no surprise to see her stockists in womenswear departments. That’s what’s so intriguing about Wales Bonner, she appeals to everybody. Her clothes are presented at men’s fashion week, but they aren’t necessarily limited to the menswear sphere. Susie Lau wears her, but so does Charlie Porter. Moreover, she doesn’t feel the need to conform to society’s narrow view of what constitutes a man, which is not only progressive, but refreshing. Some menswear designers are still catering for ‘the suits’ and ’the lads’, meanwhile Wales Bonner is accommodating the niche that doesn’t belong alongside those two. What is her niche, you ask? Nu-masculinity. Embracement of femininity punctuates much of her work. For reference, Michele’s Gucci menswear is similar; it visits similar places. 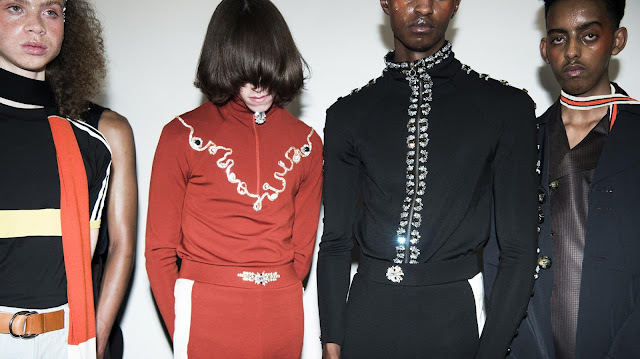 Not to discredit Gucci, but Wales Bonner is that bit more pioneering and powerful. Her exploration of black masculinity is the most fascinating facet of her work. 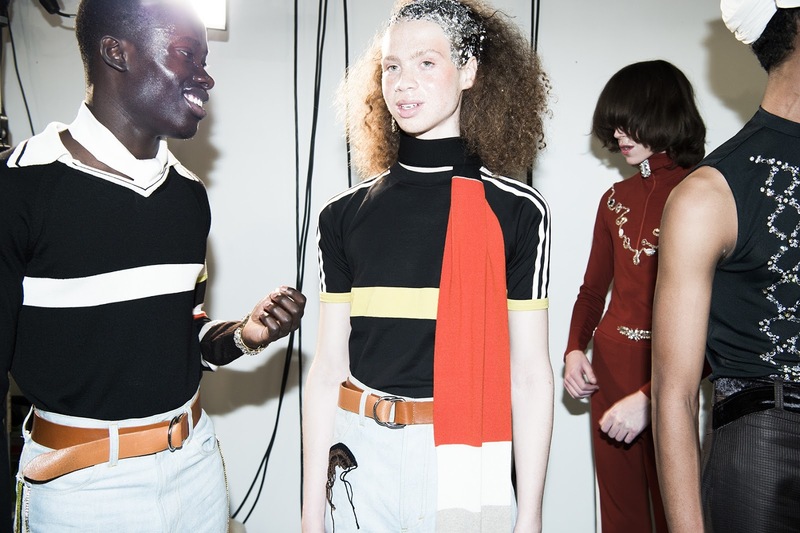 Most of the models used in her fall collection were persons-of-colour (which varies from whitewashed model castings, that dominated runways for years upon years—and still does; although the tide is turning, somewhat). Their cheeks were rouged, and excessive jewellery dangled from their wrists, wrapped their nests, lined their fingers. The 90s choker revival even featured here, with a velvet tracksuit. With their rouge cheeks, the models at her fall show stood out. 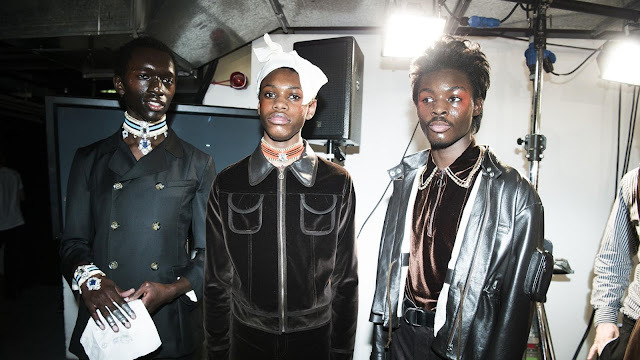 (Wales Bonner presented as part of MAN, Fashion East & Topman’s joint venture in promoting upcoming talents at London Collections Men. Her designs were the first to take to the runway). Perched at the top of the runway was a kora-playing (a West African instrument) man; models bowed their heads to him. 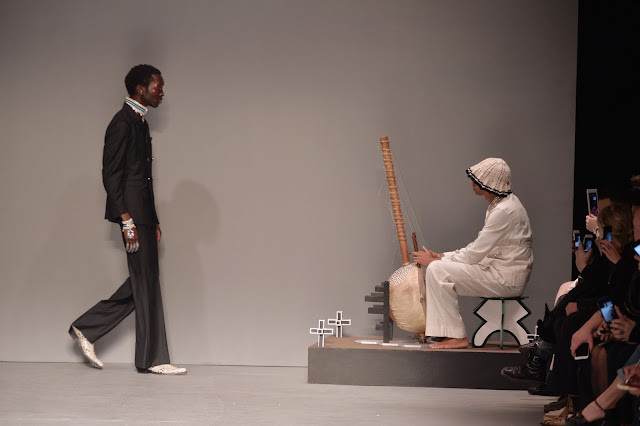 It was Nigerian-Irish composer Tunde Jegede, and he provided live music for the spellbinding display. The music was just one of many cultural references in the collection. There was Afrofuturism, African-American slave songs and tinges of the 70s and 80s in this collection. 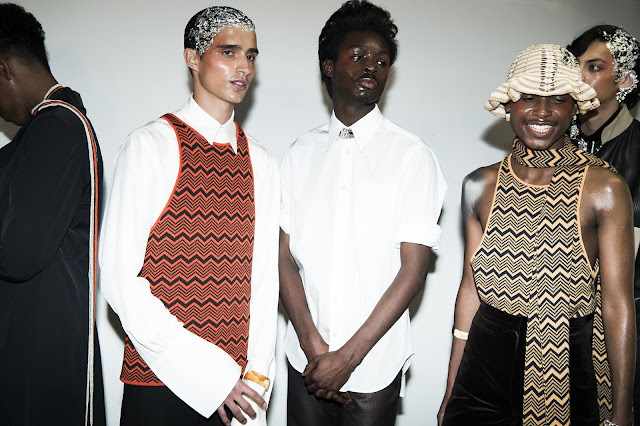 Afrofuturism inspired pops of red and yellow in the collection. Now more than ever, the cultural aesthetic is important—you might’ve seen Afrofuturist feminism in Beyoncé’s Lemonade visual album over the weekend. 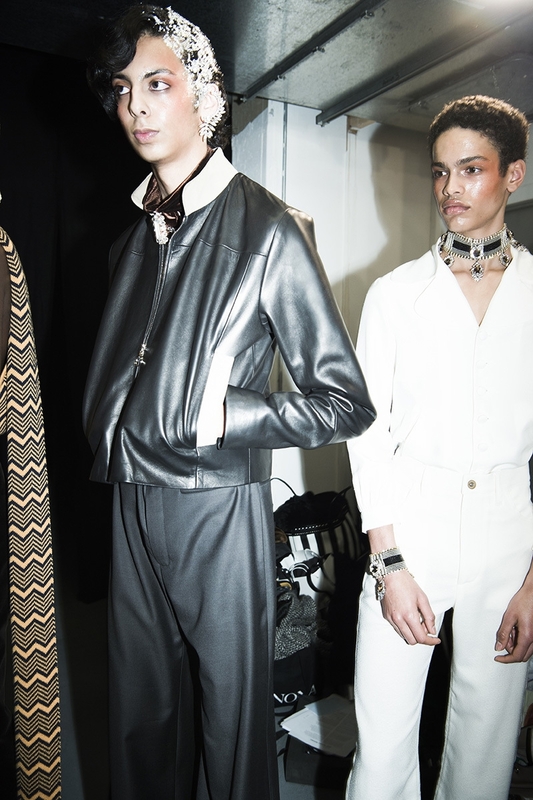 The 70s influences consisted of flared trousers, velvet outfits and pointed boots. One look reminded me of Bokeem Woodbine’s character in season 2 of Fargo. Moreover, they depicted the whimsy side to the seventies. A black leather jacket and high waisted trousers were punctuated by a waved hairstyle with silver glitter running up one side of the face. Grace Wales Bonner is on to something. She’s bringing a “beauty and sensuality to menswear”. Easily, she could be hailed the next Jonathan Anderson or Craig Green. She certainly has the talent, the ideas. 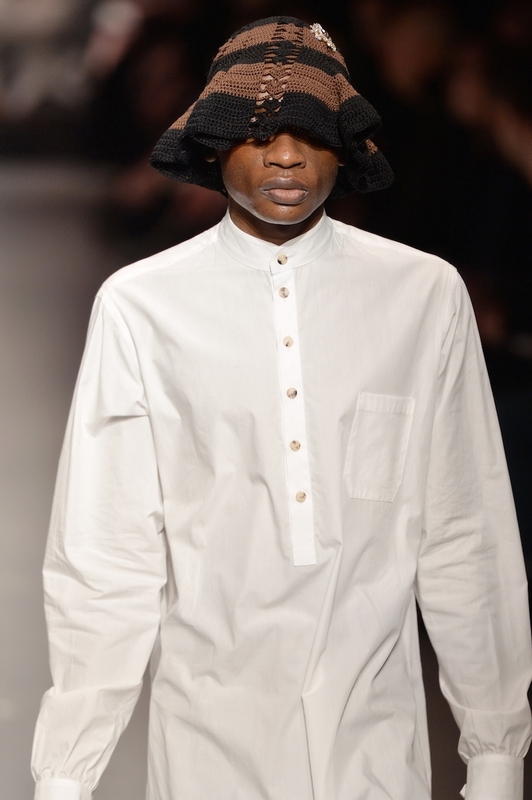 I won’t be surprised to see some of them pop up during menswear in June, or womenswear in September. It’s the domino effect. As is for many creatives, your signatures will be forged, but Wales Bonner’s handwriting is so profoundly her own, that no matter who attempts it, it’s impossible to beat the original.